Matt Jones, host of Kentucky's highest-rated radio program and co-founder of the scrappily independent Kentucky Sports Radio blog, describes himself as a "somewhat liberal, mountain, Eastern Kentuckian white guy." He adds, "There aren't a lot of those." This puts him at odds with his listeners, whose politics he doesn't share. "I'm like the liberal friend they have, so they're OK with that," he says. Three-quarters of a typical two-hour show is about UK sports, which means UK basketball. It's during the other quarter that things can get interesting. That's when Jones touches on, as he puts it, the "goofy stuff that is going on that I think is interesting." This fall that category came to include national politics, and there was enough of the goofy stuff on the show that one national media outlet wondered if Jones himself might swing Kentucky's race for Senate. It wasn't as ridiculous a notion as it might've seemed to outsiders. In the Bluegrass State, it's not so much that basketball is inherently political as that it's a unique means of getting all the state's voices into one room. 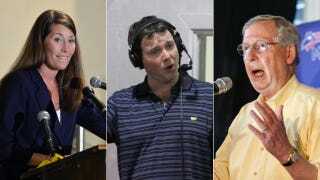 The race in question is of course the one between Senate Minority Leader Mitch McConnell, a Republican, and his Democrat challenger, Alison Lundergan Grimes. Polls going into today's vote gave the incumbent a six-point cushion or so, and a victory for McConnell, coupled with a good all-around election day for Republicans, would make him the highest-ranked Republican in the country. Despite, or perhaps because of, the race's importance, it has been an especially stupid and acrimonious campaign, with the two candidates spending months essentially trying not to poke themselves in the eye. McConnell ran on the notion that Obamacare should be repealed "root and branch," yet until recently he maintained that he would keep intact the state's wildly popular and successful health insurance exchange, Kynect—a branch of Obamacare, you might say—that has enrolled over half a million Kentuckians in health insurance. These positions are impossible to square, and yet McConnell persisted in the fiction until a spokesman finally gave up late last month after repeated questioning from the Huffington Post. Grimes, for her part, has made an asinine show of refusing to disclose whom she voted for in the 2008 and 2012 presidential elections, as if a Democratic candidate with a big (D) beside her name not saying whether she voted for the winning Democratic presidential candidate will win her points with voters. Jones spent months repeatedly challenging both candidates to come onto his show and answer questions. He says he wanted to ask "real questions" and see what happened. Both candidates ultimately agreed, and Grimes came into the studio for a discussion on Sept. 25. When McConnell couldn't settle on a date Jones heckled him for the next two weeks, until McConnell made an unannounced call into the show. Jones: Do you believe marijuana should be legal? Jones: ...I know we have to follow them, but if you were the one in charge, if a bill came before the Senate that said "In America the recreational use of marijuana would be allowed," would you vote for it or not? Grimes: Well this past general assembly session we saw cannabis oil. The arguments that were made before the state general assembly on how it could actually help children with severe disorders, and I was very much in favor of that. I'm in favor of having the discussion, especially to reclassify the use of marijuana. We haven't had a senator that's even wanted to have those discussions though. Jones: But that's still not an answer. If a bill came up, let's say like in Colorado ... to legalize marijuana, would you vote for that or not? I appreciate the phrase "let's have a discussion," but that doesn't get me anywhere. Jones: ... no let me ask you what you think on the issue. Grimes: ... he was at a fundraiser recently and someone asked him what he thought about the legalization of marijuana out in Colorado. He didn't even realize that it had been legalized. He didn't even realize the economic benefits that have been seen. Jones: You realize it though, so would you vote for it? Grimes: I would want to have the discussion. And I think it's worthwhile to bring the experts together and talk about the reclassification, especially for medical purposes. "This is the litigator in me—I don't let you just get away with something," says Jones. "If you say something, I am going to pound you on it." As incongruous as it seems for a sports radio show to figure in a prominent election, politics are in KSR's DNA. Jones and a friend founded the site in 2005, as a place to distribute the podcast they were beginning. Taking inspiration from—of all places—how Howard Dean's calamitous 2004 presidential campaign used the internet, they added a blog too. Fast-forward a decade and the site looks like the thousand other crappy SEC blogs and forums on the internet, but that's where the resemblance ends. KSR is a fan blog that has swelled to employ three writers besides Jones, which frees him up to host the radio program. An Eastern Kentucky native, Jones graduated from Duke Law School (second in his class, reportedly) and eventually joined Kentucky's biggest law firm. After four years juggling corporate law with sports blogging and radio, KSR was cutting too deeply into Jones's billable hours at Frost Brown Todd LLC, so he left to start a small firm with a friend. What that meant was that when Karen Sypher went on trial in 2010 for extorting her onetime paramour, University of Louisville (and former UK) head basketball coach Rick Pitino, Jones could be there. "They wouldn't let you take your phone into federal court," Jones said, "so during the breaks I would come out and tweet out the most interesting stuff, and it just took off." For reasons that aren't fully clear—Jones speculates the college-town media took it easy on Pitino and didn't think readers would be interested—the local media pretty much ignored the trial until Jones's coverage blew up. While the Pitino trial is how Jones first made his name nationally, his reputation in Lexington came from his basketball coverage. "Billy Gillispie, the day he was fired, I met him in the hall at the UK practice facility," said Jones. "He looked at me and said, 'You're the reason this happened.'" He disagrees with Gillispie's analysis, but the mere fact that it's even plausible at all speaks volumes about Jones's power in Kentucky sports media. He says his website is profitable and pulls in five million page views a month, and his radio show is in 30 markets. That it was a natural step from there into politics speaks to Kentucky's complicated and bifurcated identity. It was a slave-owning state that didn't secede. It is Midwestern and Southern, Rust Belt and Appalachia, the birthplace of Lincoln and the birthplace of Jefferson Davis. It elects Republicans as senators and Democrats as governors. Basketball, and particularly UK basketball, serves as a sort of lingua franca, which is why sports and politics tend to mingle so freely in the Bluegrass State. There was, for instance, the McConnell campaign's ad, released in March, depicting what it thought was a bunch of joyous UK basketball players. It turns out they were actually Dukies celebrating their 2010 NCAA championship. That clip was quickly replaced by one featuring then-UK star Julius Randle, which promptly embroiled the school in an NCAA compliance investigation over the use of athletes' images. "I'm not the first person to say this, but the state of Kentucky has pretty generally throughout history been mocked; people look down on Kentucky," says Jones. "The thing this state has always prided itself on is we do one thing better than you, and that's basketball. We do it better than you." Jones's show is owned by iHeartRadio and distributed to 30 radio stations across Kentucky. To license the show, stations give iHeartRadio half of their ad inventory for it to sell. iHeartRadio sells spots network-wide, giving advertisers a highly coveted opportunity to reach listeners in every nook and cranny of the state. Lately, of course, those advertisers have been politicians. "I think if you were to talk to the campaigns, they would tell you there are no ads that they run—unless they run it during a Kentucky game—that are more heard than the ads they run on our network," says Jones. If Jones has been able to attain that kind of reach, it's largely because of a truth that serves as the central conceit of his show: it is impossible for Kentuckians to get sick of hearing about UK sports. As he says, there is no baseball in July there, just UK sports. They are a point of consensus for which there are very few parallels anywhere else in America, and nearly none in national life. Having a ready audience of people as interested as he is in obsessive minutiae—recruiting mailers, say—isn't the only anomaly that's contributed to Jones's success. While Kentucky journalists criticize Jones for all manner of supposed sins, at the heart of them all is his amorphous position in the media spectrum. A Lexington Herald-Leader piece on Jones quoted the sports editor of the Louisville Courier-Journal as saying, "'I think Matt Jones and KSR act as though they're traditional media when it suits them, but they turn on traditional media when it suits them. They play it both ways.'" Jones doesn't deny the charge, and is in fact adamant that he is no journalist. "The easiest answer to that is no," he says, "because that makes everybody happy." His basic position is that he'll run his website and show in a way that best serves his readers and listeners, whether or not anyone wants to call it journalism. Not coincidentally, that generates the most profit. To bring politics into sports without politicizing them takes a certain personality combined with an audience obsessively engrossed in one thing, and the kind of market that allows a personality to work as a fan who happens to have the benefits, if not obligations, of a journalist. And given all that, Jones's role in the local order of things makes perfect sense. To transcend that order, though—to step onto a platform of an order of magnitude larger, like Sirius Radio or the SEC Network—Jones will have to prove that he's something other than just the product of a very particular set of circumstances, and perhaps even answer a simple question that goes to the nature of what it is he does that's allowed him to play such a curious role in such a curious state. "What I am?" he says. "I don't really know the answer to that."